It begins! All of the menu planning and mulling over recipes for the big Thanksgiving celebration is here. I love every second of it. Will I go with the traditional family fixings or try something a bit more offbeat, like quinoa and fig stuffing? By the way, if you’ve ever tried that, please let me know if it’s good because I’m intrigued. Every year in our family, we get together at my folks’ house for a big Thanksgiving Day celebration. My mom and dad usually take care of the turkey (sometimes two, even) and while there are several recipes they use and rotate between, they always keep it fresh, interesting and delicious. Sometimes a cranberry glazed turkey and sometimes a fried turkey *sigh*. I love me some fried turkey. These big get-togethers are great and it’s a priceless opportunity to visit with my family, relax, and basically gorge ourselves on the scrumptious fair, but the problem is this: not having the large amounts of leftovers to take home, in which to live off of the rest of the weekend. For me, it’s not Thanksgiving unless I am eating turkey, stuffing, cranberry and sweet potatoes in some form or another until the beginning of the following week. An opportunity presented itself a few years back when my husband’s cousin, Dan, began visiting us every year for Thanksgiving. He was a piano student at the University of Cincinnati, Conservatory of Music and for the four years he was in school, Dan would drive up and visit us for Thanksgiving weekend. He would bring us Graeter’s ice cream from Cinci, I would make us a big crock pot full of sausage and peppers for Wednesday night’s dinner, and he always, always helpped my husband put up the outside Christmas lights. His visits also gave me a great excuse to cook up a Day-After-Thanksgiving-Meal that would generate the perfect amount of leftovers to see us through the weekend. These day-after-Thanksgiving recipes are the ones that make up ‘My Ultimate Thanksgiving’. ‘My Ultimate Thanksgiving’ meal has to start with the turkey-because we all know that the turkey is the showpiece of the meal. Now, because I was roasting a turkey to essentially create the traditional ‘Thanksgiving leftovers’ I knew that I didn’t need to roast a whole bird. A whole breast, on the other hand, would be perfect. Luck found me, while I was menu planning that first year, by the way of the Martha Stewart Show. 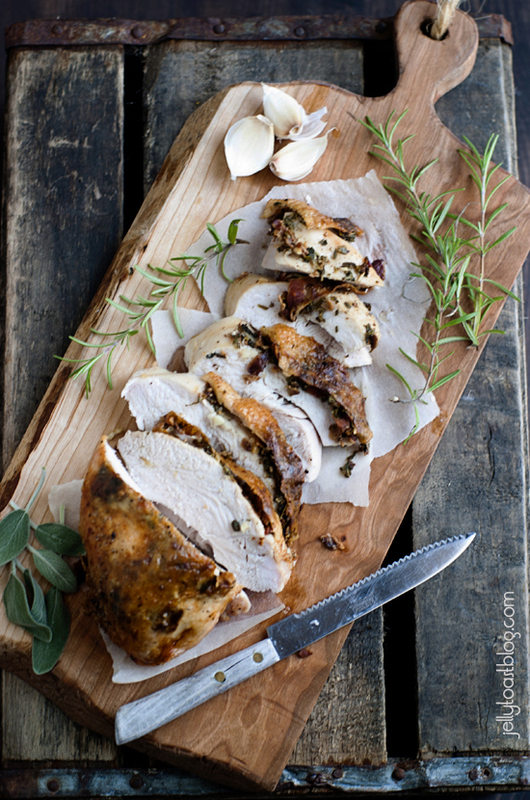 It was recently after she and Emeril joined forces, and he appeared on her show making this unbelievably brilliant looking Bacon and Herb Roasted Turkey Breast. My eyes were glued to the screen and I knew as soon as Emeril said ‘fried bacon’ that I had found my recipe. The turkey breast is rubbed under the skin with a bacon/herb/garlic compound butter and then -brace yourself- basted with the reserved bacon fat. Yes, you read that correctly. Bacon. Basted. Turkey. I have made this turkey breast every year since Dan’s first visit. It is knock-your-socks-off good on the first day and it also makes the best turkey leftovers you’ll ever taste. Last year was the first Thanksgiving after Dan’s graduation and it just wasn’t the same without him. Frankly, I am not as good maneuvering an extension ladder to put up Christmas lights as he is. He’s graduated now, and is a professional musician living and working in the Big Apple. We’ll miss him again this year, too. This turkey is for you, Dan! Preheat oven to 375 degrees. Set a roasting rack into a roasting pan large enough to accommodate your turkey breast. 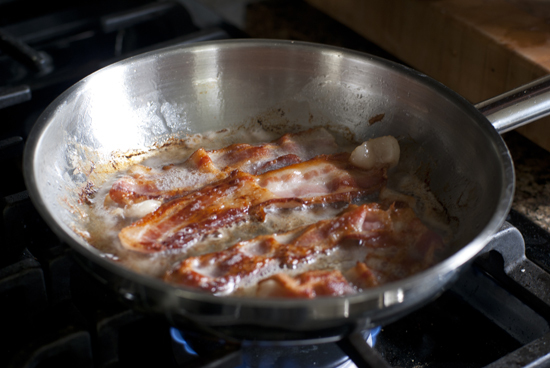 Place bacon in a medium skillet over medium heat and cook until crispy. 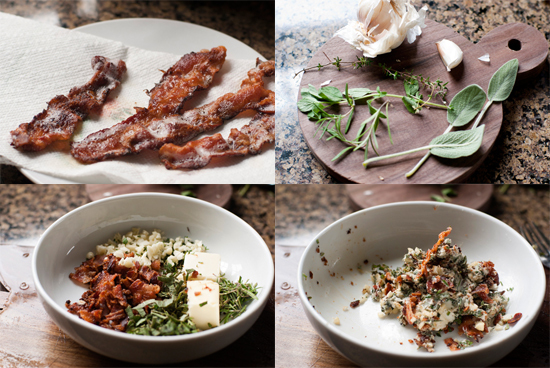 Transfer bacon to a paper towel-lined plate to drain and reserve bacon fat. After bacon is cool, finely chop it and place it in a medium size bowl along with the garlic, sage, rosemary, oregano, thyme, butter, 1 teaspoon of salt, and ½ teaspoon of pepper. Use a fork to mix the ingredients together to form a compound butter paste. 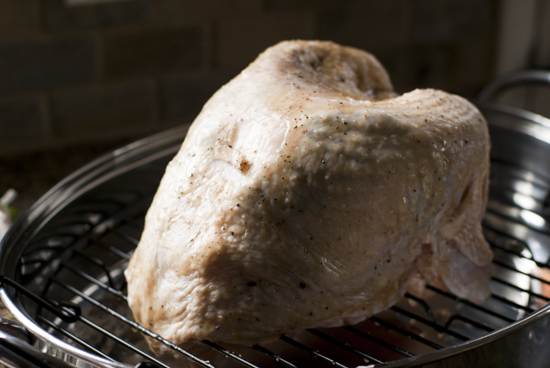 Using your hands, gently loosen the skin of the turkey breast away from the flesh, creating a pocket. Spread half of the compound butter under the skin of each breast half. Use your to push and spread the butter evenly under the skin. Sprinkle the outside of the turkey with the remaining salt and pepper. Using a basting brush, brush the skin of the turkey with the reserved bacon fat, making sure the entire breast is well coated. Place prepared turkey breast on roasting rack. Bake the turkey breast, uncovered, for about 1 hour and 15 minutes – 1 hour and 30 minutes or until an instant read thermometer placed into the thickest part of the breast reads 165 °. **Be sure to check the thickest part of the breast to ensure doneness. 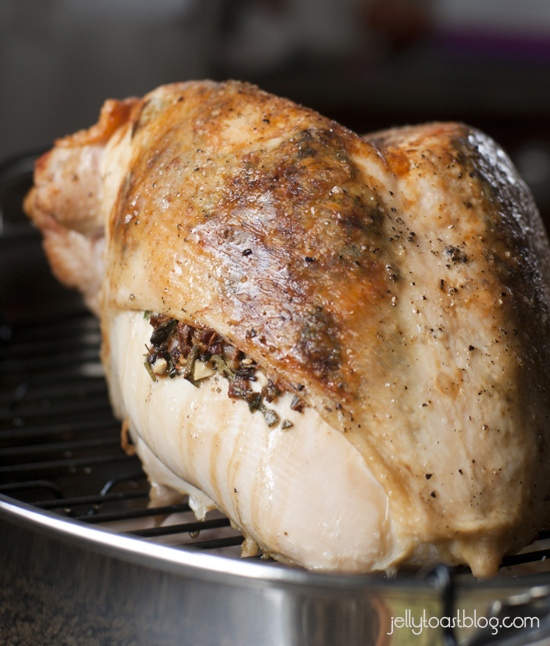 Remove roasting pan from oven, tent turkey breast with foil, and allow to rest for 20 minutes before carving. Serve turkey with pan juices. This looks delicious! Excellent for a small Thanksgiving! That’s exactly why I like it, too! Perfect for a small crowd. Have a Happy Thanksgiving! Do you think it would be too much for a regular turkey? 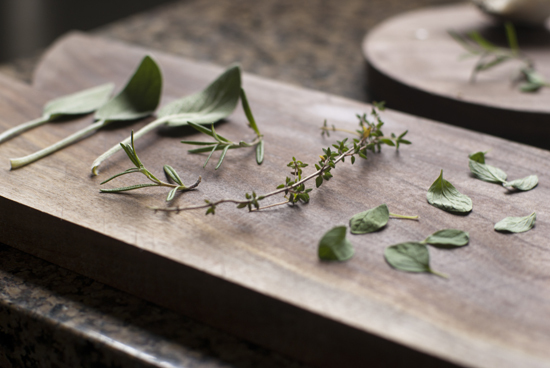 I am loving the bacon/herbs thought. I think this would work great on a large turkey. I would just adjust the amount of butter/herbs/bacon etc to accommodate the size of your turkey. And of course roast it longer, as well. Let me know how it turns out! Have a Happy Thanksgiving! Em – this was amazing! Ben did a happy dance when he saw me putting bacon in the turkey. Chris declared me ‘master of creating turkey’ (I’m pretty sure he was talking about the bird and not the kids). Moist, delicious and easy! Thanks for the recipe. Basting with bacon – brilliant!!! I made 2 substitutions – I quartered 2 apples and stuffed the turkey with those. I used a cleaning product that smelled of rosemary and now have issues with it in food so I replaced that with poultry seasoning. Amy, I’m so glad your whole family liked it! 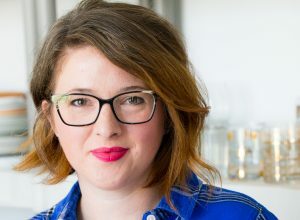 The apple idea sounds awesome (what’s not to like about bacon and apple?) and I totally understand about the rosemary, lol. I hope you guys had a great Thanksgiving! Worked very well! It was delicious. Thanks for posting. I’m so glad to hear it, Rhonda! I made this turkey 2 years ago and it was amazing!!!!!! Best turkey I have ever had in my life. Very flavorful and moist! Thinking about trying it again this year with the whole bird.. much bigger crowd 🙂 Thanks again for sharing! Can this be done with skinless turkey breasts?